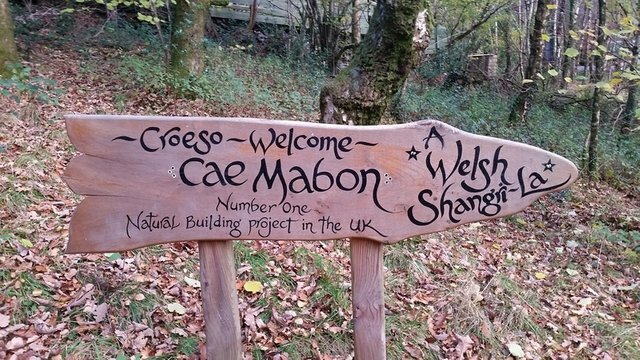 Natural Builders Journey #1 Cae Mabon. This is the first post in a series in which I will take you on my Journey to becoming a Natural Builder. And for this episode You will explore a place that really captured my Imagination. A place where for the first time in my life, I was seeing buildings I had only ever seen on a computer screen or in a book before. This place really fuelled my fire and inspired me to go in search for more, I told myself if they can do it, then so can I. The only way I Can really describe how I felt when I first went there, Is like walking into a real life fairy tale. everything about this place was magical from the location to the buildings and the extreme sense of Natures presence. 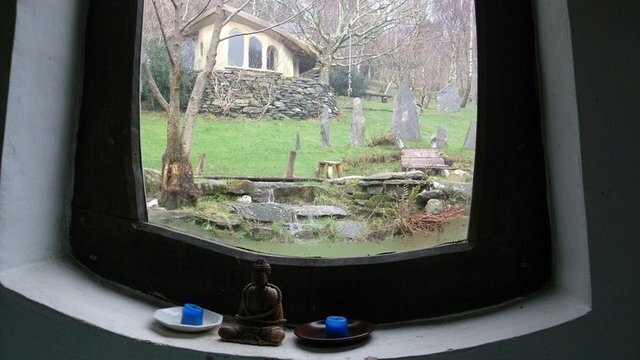 Cae Mabon is an Eco retreat centre nestles at the foot of Elidir Fawr in an oak forest clearing by a little river that cascades down to the nearby Llanberis lake. With the summit of Snodon Moutain just five Miles to the Southwest. The Above picture is taken from inside the communal Building, a renovated barn containing a fully equipped kitchen and a spacious eating and meeting room. 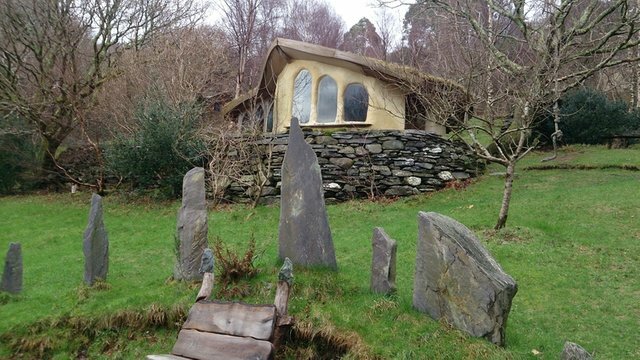 And what you can see on the outside is the Glorious Cob cottage but we will come to that in more detail later. 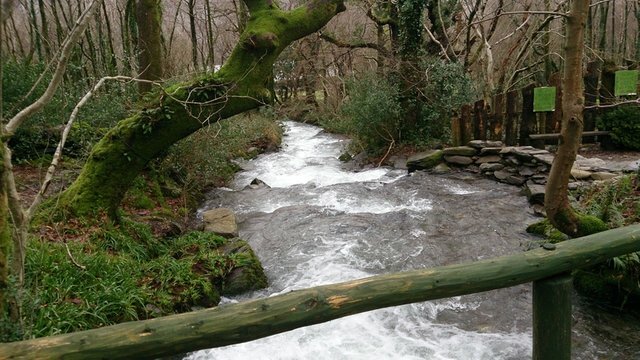 Running Down the side of the eco settelment is a majestic River, water hurteling down at such pace and power, the sound of the water cascading down can be heard all around Cae Mabon. It was such a soothing sound almost like it was massaging my brain. 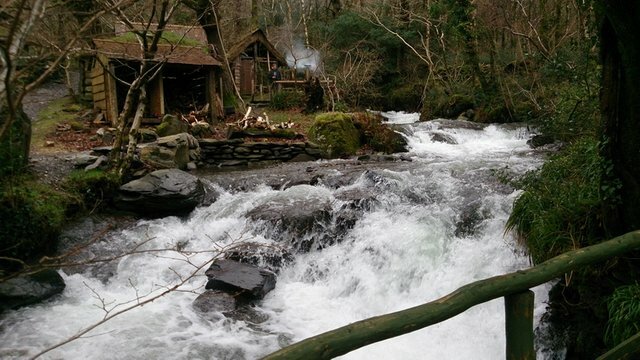 Just Beyond the river you can see a few beautiful earthy building perfectly blending into their surroundings and the smoke emanating from the wood fired Hot Tub. 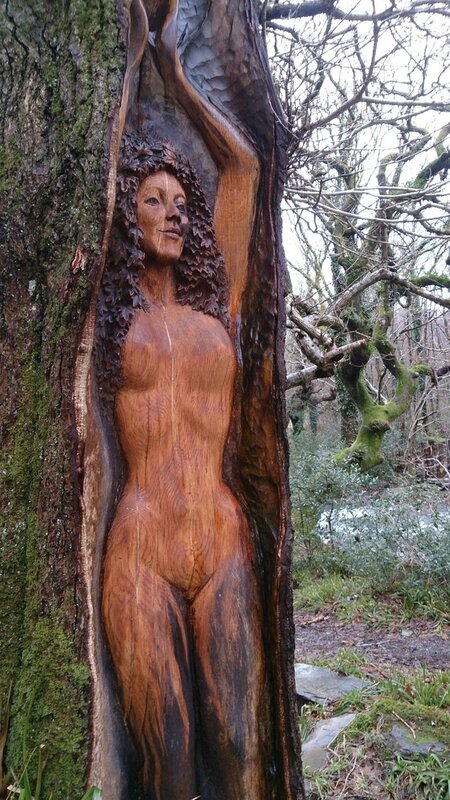 This sublime wood carving of a Nature Goddess looks directly from across the river gazing and keeping Cae Mabon safe. 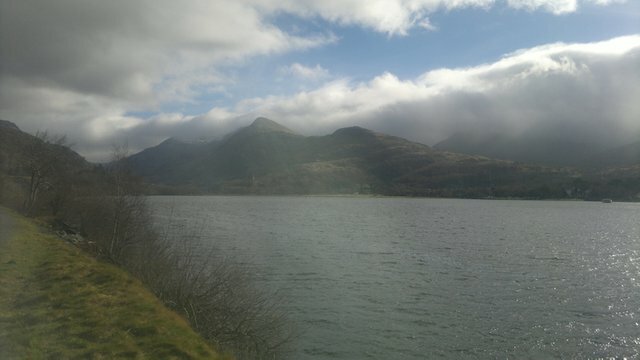 Directly behind where I took The last picture the River cascades down for another hundred mitres or so into the Llanberis lake, which we will go and have a look at later. Another Angle with more of the river, cascading with so much power. 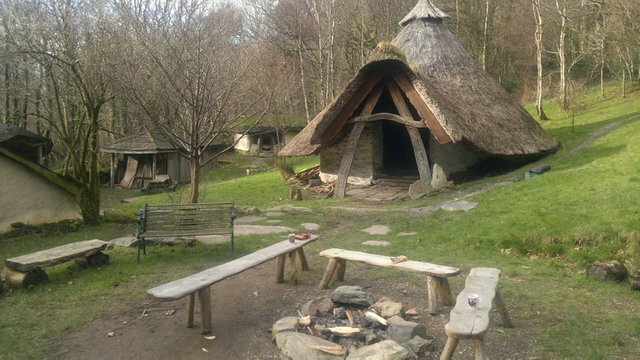 The centre of the Eco Settlement and the location of the iconic Thatched Celtic Roundhouse With a fire in its hearth and smoke rising from the thatch it’s been the home of many convivial evenings of song, story and chat. 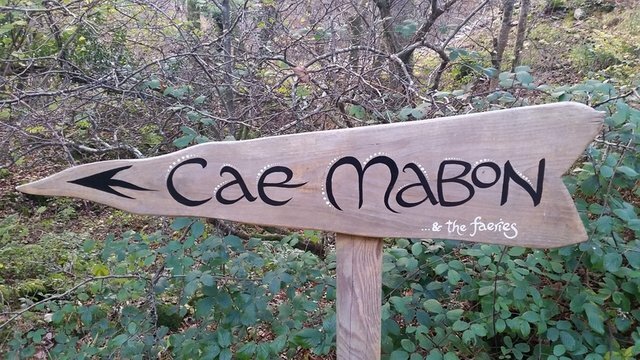 Infact Cae Mabon has people come from all over Britain and the world for Events include song, dance and storytelling workshops; healing and therapeutic groups; yoga, meditation and green spirituality retreats; Celtic landscape and mythology tours; school groups and youth environmental camps (including ‘rites of passage’ events for young people); corporate intensives on creativity and communication; mini eco-festivals. People come to learn about natural building, for seasonal celebrations and for weddings. Every year there are open weeks (for those who simply want to experience the place) and the ever-popular April and October working parties. 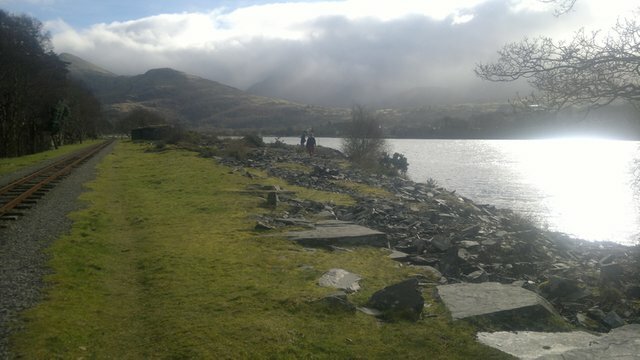 Beautifully placed slate, a typical resource in north Wales and having them standing on edge just gives a great sense of connection with the ancestors, who also used to stand stones on these British isles many thousands of years ago. 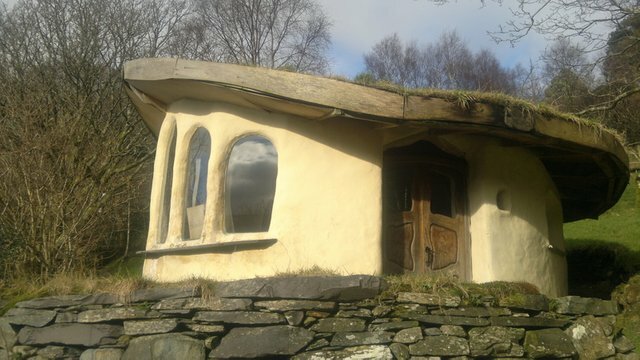 Behind this the absolutely sublime Cob cottage, this building was constructred by famous eco builders named Ianto Evans and Lina Smiley and a group of volunteers over a few weeks, A hand sculpted house. 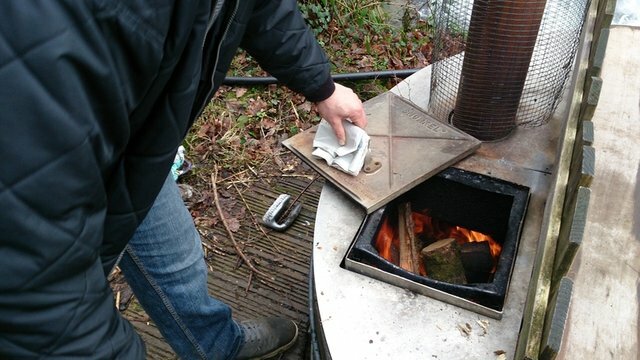 It has a very intersting feature inside called a Rocket Mass Heater. This is my personal favorite and the one I have spent the most nights in, The Log lodge a Navajo Hogan design, octagonal cedar logs notched together, it has the feel of the forest with its arms around you when you are inside. The redwood Chalet, built using the cordwood technique with the logs on edge. 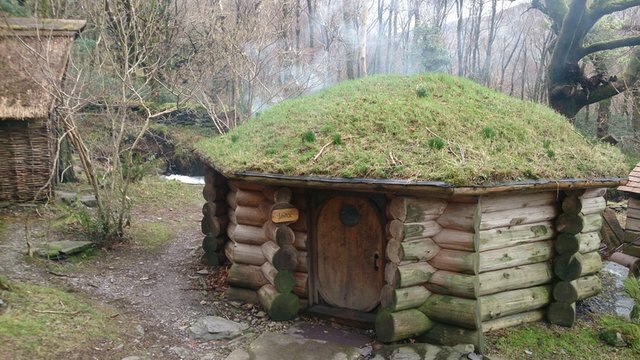 The Hobbit Hut, Yes a real life Hobbit house and yes you can't help but feeling that you are actually in lord of the rings in some corner of the Shire. 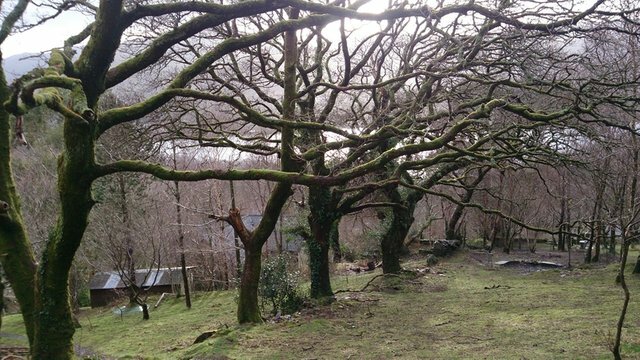 Looking further up the hill on the right the river and the left another Timber Cabin, in total Cae Mabon can host up to 30 people. 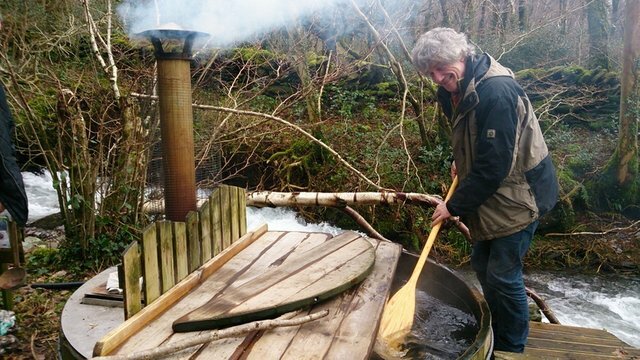 The cherry on the cake, a wood fired hot tub right on the edge of the river. I just love the smile on Eric's face as his stirs his tub, this is the Gentlemen who own this amazing place and has spent years making it all happen. 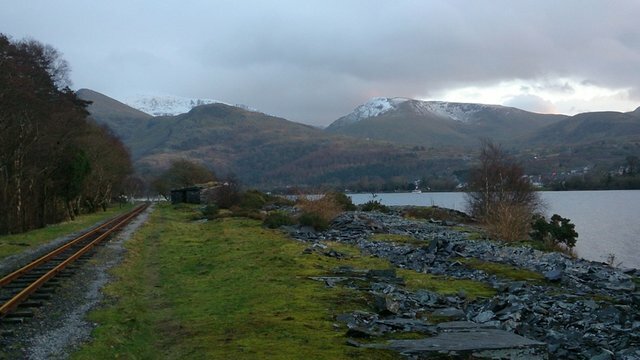 Just a short walk down the hill from Cae Mabon you will find the Llanberis lake and stunning views of mount Snowdon covered in snow. I was lucky enough to revisit this wonderful place several times and I managed to get the same shot of the mountains without snow. 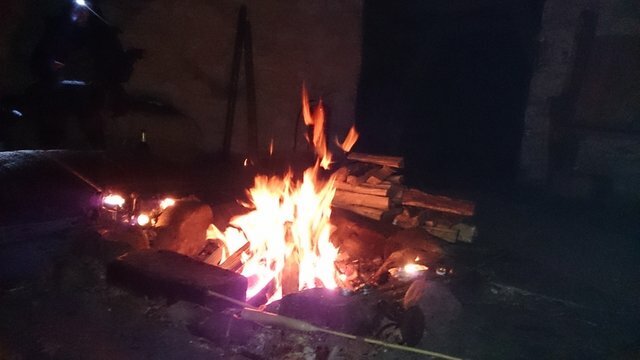 No tour of Cae Mabon would be complete without a night around the fire in the Celtic round house, sitting in there is almost like sinking into a deep, older, ancient and more primal part of yourself. Drumming, singing and telling stories and much much more. The element that connects it all, Fire!!! 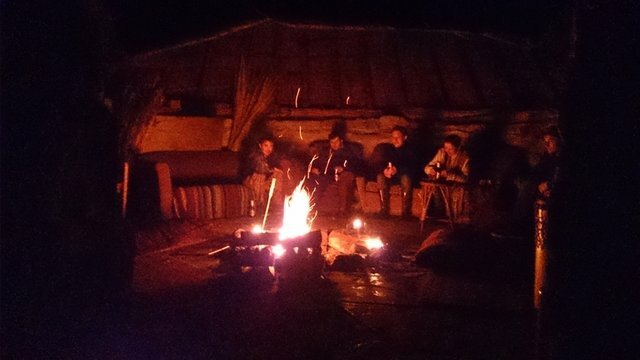 It was at this Point sitting in the roundhouse with my friends that I came to a very important realisation that would mould and shape my future decisions, And that was the importance of Community, something that was really lacking in my day to day life, a sense of connection and belonging that I had found in this magical place. The emotions and feelings from discovering this place will stay with me forever, and my newly acquired experience will lead me on to a path that I still follow till this day. Thanks for reading this episode of Natural Builders Journey. If you enjoyed it please feel free to vote, resteem and leave a comment. I would really love to hear what you think. 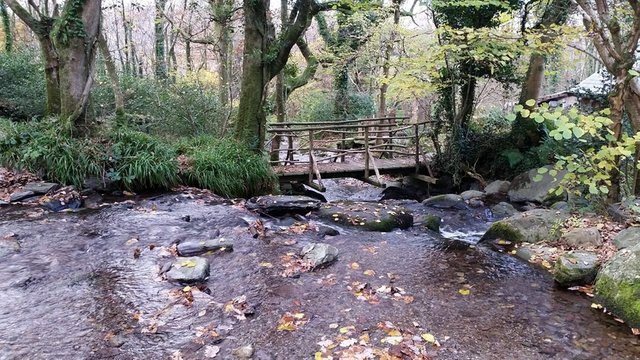 What a work you put in this post and what an amazing place, very inspiring indeed. Loving this female goddess carving also, i guess she is put in the half hollow tree and not cut out of it? Beautiful post, again and again, a top ecoTrain production, thanks! Oh wow thanks brother, its a pleasure. The goddess is carved in a part of the tree that was damaged i believe. A section of it fell into the river. I will ask Eric again. Wow, this is an amazing post indeed! You are right I LOVE it. I am all for natural living and when it can be this beautiful that is a BONUS! Looks like a fairy tale indeed. Hope this inspires more to consider a more natural life! I will get this post some attention so u make more for it. I will also give you a follow to see what else you share. Aww man that means a lot to me bro. thanks ever so much. I hope to share much more in the coming days. I love your work too I will keep an eye out for your posts. oh wowwww. what a place! i had no idea about it.. I will definitely visit one day when i head to the UK again. 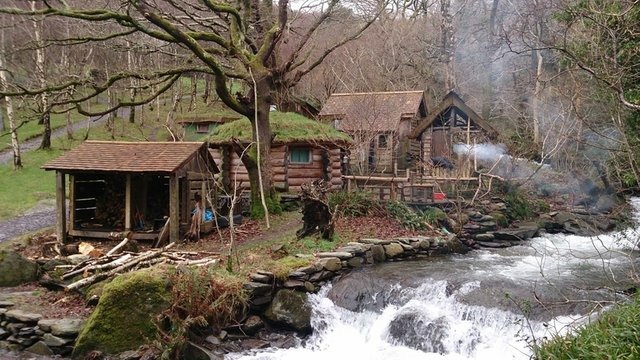 HOw cozy and divine does everything look with those rustic cabins, hobbit houses, wood fired hot tubs.. streams and im sure wonderful people..
Can't wait to see the next installment Hassen! It's just wonderful that you are putting so much time and love in this.. Remember, even if today not so many see this, your post is immortalized on the blockchain forever! Also Steemit is VERY google friendly and so even people who just search Google for this will find it and don't even need an account to read and enjoy! I can't thank you enough for introducing me to this place my friend, I can see the light now and the future looks very bright. Beautiful post about a wunderful place. It IS a fairytale! Earth, water, fire air! I follow you. Thanks my friend please follow me for more posts like this. Thank you for taking the time to write this story. It is a beautiful tale, beautifully illustrated with your photos. 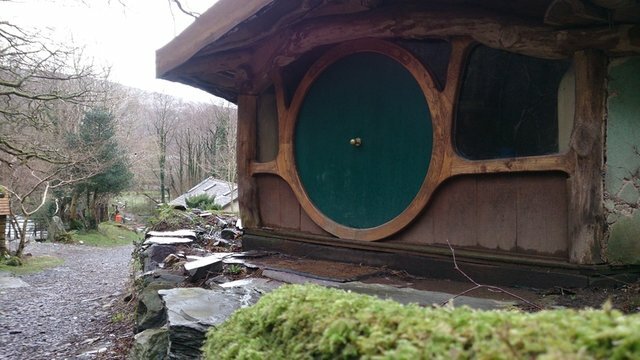 Having read Tolkien, Lewis, and more recently Stephen R. Lawhead, I have dreamt of such retreats. Very, very appealing. Thank you again! Thank you for taking the time to read it my friend, I had so much fun making it and look forward to many more to come. Being a bricklayer by trade and having some experience with clay plastering I really enjoyed your article, which for sure was a lot of work. Also very nice that you put a lot of photos, so we can get a better idea of this magical place. Looking forward to many more articles about natural building from you. This is amazing! If ecoTrain is ever an actual success can we have a retreat there? Huh? Absolutely mate, it can be arranged. Its the perfect surroundings for an eco train gathering. Ooh, something to strive for! Absolutely mate I see visions of a future like that too and I have seen it manifest in front of my eyes for the last few years. Oh wow Cheers mate, much appreciated. It's really nice to find a lot of like minded people on here. I sure will be following you and keeping an eye out for future post. Thank you, and likewise! It's true, at first I felt like nobody here shares my interests, but there are more and more. So of course, I'm following too. That looks so wonderful Hassen! Thank you fro sharing. Alex and I will definitely come and visit when we're in UK. I would love to see it with my own eyes! 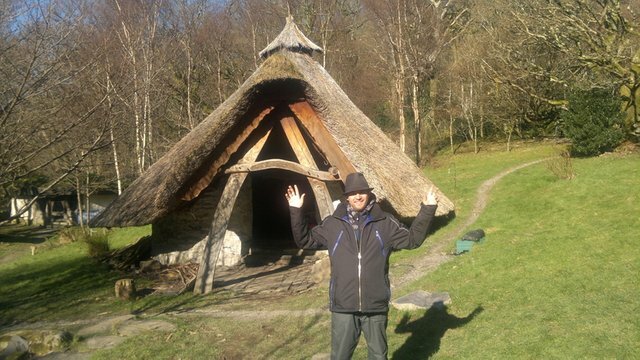 Much appreciated Clara <3 I look forward with great anticipation the day we visit Cae Mabon together. Wow Hassen! You are a very good writer and photographer :) thank you, and i look forward to more of your journey! Thank you lovely Man, I extensively capture all the work I do in picture, the only thing I have lost over the years is sadly my visit to Brighton when I first met you. its all on an old Phone that I can't seem to access any more. What a beautiful post, and place, indeed! Thats the way i would like to live. 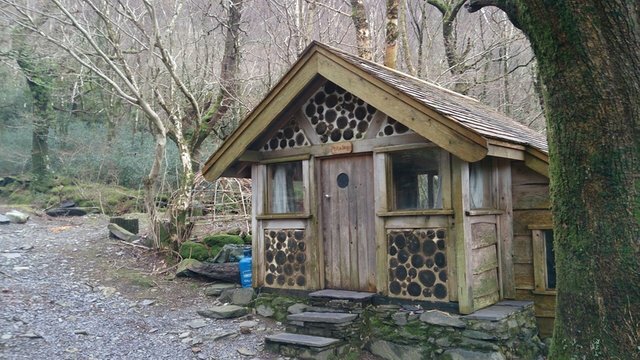 thanks @blueperegrina It's my dream too and I have joined a group working on establishing an eco village in North wales. so I will have loads to share for a long time to come hopefully. 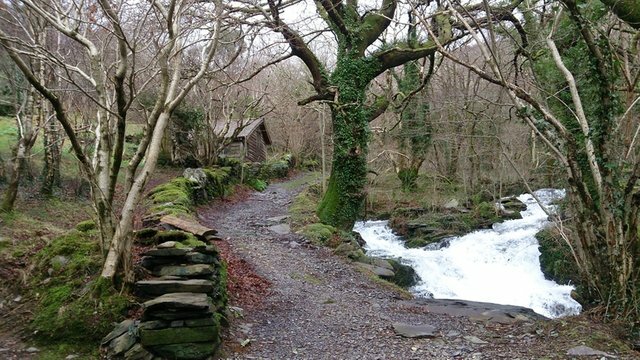 keep me a little plot ;-)) was always me dream to live in Wales.. who knows! I hope so brother, at the moment we are discussing the possibility more people joining. Wow What an amazing place ....Truly magical . I definitely will be happy to visit . I think I am sensing a strong need for an EcoTrain Cae Mabon Gathering ?? This is awesome! I would love to build my own home with my own two hands! New follower here with an upvote and resteem. Looking forward to more stuff like this! Absolutely amazing beauty. I'll be following to see more like this. Will you be doing any personal building projects that you will share? Very cool! I look forward to seeing them.